Jack and Joyce Parsell occupy a special niche for geographic extreme fans. If you say they have taken you to a new low, that's a compliment. If you want to talk to them about condominiums you won't be talking apartments, you'll be talking about quirky European borders where two countries jointly own land. Jack and Joyce whose distinctive smiles have graced every Highpointers convention from the first gathering of 9 in 1987 on Arvon -- the only living members to have done so. Not content to just complete the 50 states, they have branched out and created sort of mini cults for those seeking geography extremes with groundbreaking books on "The Lowpoints of the United States" and "Tripoints of the U.S."
Along the way, Jack was awarded the Club's Vin Hoeman Award in 1994 along with his climbing friend Clark Hall who died in 2002. Jack and Joyce, who will be celebrating their Golden Wedding Anniversary in 2004, have had a sort of fairy tale romance ever since meeting on an island in the St. Lawrence River -- near a border of course. Even though they have traveled extensively all over the world they still live within 100 miles of where they were born in upstate New York. Here's a conversation with Jack and Joyce. In the Above photo at the Kansas-Oklahoma-Colorado Tri-state marker, during the Oklahoma 2002 Convention Jack and Joyce Parsell are 2nd and 3rd from the right. Roger Rowlett with his dog Zephyr is on the right. I was born Aug. 14, 1921, in Auburn, NY where I attended high school. I was a Boy Scout and became an Eagle Scout and attended the First National Boy Scout Jamboree in Washington, DC, in 1937, and also served in a Boy Scout Service Patrol at the New York World's Fair in 1939. I graduated from the SUNY College of Environmental Science and Forestry at Syracuse with a B.S. in Chemistry and Chemical Engineering. My first job out of school was with General Electric at Pittsfield, Massachusetts during World War II. During my time there I climbed Greylock from about every way you possibly could. I also hiked Vermont and New Hampshire. After the war, I accepted a job offer at J.P. Lewis Company in Beaver Falls which is about 100 miles north of where I was born in upstate New York. Beaver Falls is a hamlet not even incorporated I liked it so much that I stayed there until I retired in 1983 from what was then Boise Cascade. I was a mill chemist and engineer. One of the most famous products we developed was Tensilite which was used on the back of table radios during the 50s and 60s and other laminates used for electrical insulation. From an earlier marriage I had a son Tommy who died at six and daughter Susan who now lives in Olathe, Kansas. She has two children -- Jeffrey and Jenny. Jenny has two-year-old daughter Nicole. I was born in Fulton, NY, lived in Oswego and later Watertown. I taught elementary grades near Watertown. How did you and Joyce meet? We met on one of the "Thousand Islands" in the St. Lawrence River near the New York-Canada border. Mutual friends owned this little island. In 1953 I was helping to install in a water pump. Joyce came by and I was attracted to her. We got married a year later and had our honeymoon on the island where we had it all to ourselves. What was your first highpoint? I climbed Marcy in July 1939 when I was 17. My dad was interested in all sorts of outdoor activities. He was secretary of the Finger Lakes Outing Club. My interest in hiking, climbing, skiing, canoeing, and all that came naturally. Did you continuously highpoint from 1939 on? I was always camping and hiking. It wasn't until I retired in 1983 that I had the time. I still visited several highpoints in the 1950s through the 1970s by just looking at highway maps. We climbed Brasstown Bald before the structures were there and Cheaha before the resort was built. We hiked the South quite a bit in the 1950's when we drove to visit my father who had retired to Florida. In the 1950's, I tried to go to Campbell Hill. That was when the radar station was there. There was a big fence around and I couldn't visit it. During the 1960s I didn't have the time to do as much because I didn't have enough vacation time. We would still go on canoe camping trips in the Adirondacks where we always climbed a mountain. But they weren't highpoints. The Adirondack Park is just a few miles east of our home and Lake Placid is about 100 miles away. In 1971 I finished the Adirondack 46'ers (the 46 peaks above 4,000 feet) the first time. I am now trying to climb them all a third time. Joyce, how many highpoints do you have? I've done 37 highpoints and 39 of the Adirondacks 46'ers. Marcy and Guadalupe were probably the most difficult highpoints that I have climbed. I've made some longer hikes in the Adirondacks. One day we had a 16-hour day. I was ready to drop. Joyce, were you into camping before you met Jack? Not particularly. I enjoyed the winter type things. Skiing, tobogganing, things like that. What started you doing it for a list? I bought Frank Ashley's book in 1970 and I set a goal. In the late 1970's, a friend said that if we are going to climb McKinley we better do it soon. We did in 1981. Once I did McKinley, I decided I better do the rest of them. Was it difficult doing the last 10 highpoints and visiting 42 highpoints after your left arthritic hip was replaced in 1986? I don't think my doctor would have approved of me doing it so fast after the surgery in January. But he was a hiker and climber too and he knew he couldn't tell me not to. Clark Hall and I had been hiking and climbing for several years. We started hiking in the Adirondacks less than three months after the surgery. Then on our western trip in June I used two ski poles to make it through the snow on Wheeler and Whitney. We did eight highpoints that June, but only four were new ones for me. You and Clark did a lot of hiking together and were the Highpointers Club Vin Hoeman Award in 1994 together. Tell us something about Clark. Clark was born in Indiana. He was a month younger than me. He graduated from the University of Michigan with a degree in chemical engineering. I met him in the 1970s. He was product manager for Moore Products in Buffalo. He called on me. We would talk business for a while and then we discovered we were climbers we started talking climbing. He would come for lunch to our house which he dubbed the Gourmet Kitchen because the standard fare was a sandwich and a bowl of soup. That's still my standard lunch. He had hoped to climb McKinley when I did but he was not able to because he didn't have enough vacation time. Clark and I were to climb all over the world. We climbed Mont Blanc and the Mexican volcanoes including Pico de Orizaba. in order to get them tight enough. Tell us about the first Highpointers gathering on Arvon in 1987. I wrote to Jack Longacre after seeing his article in Outside Magazine and he mentioned that he had already heard from several other persons interested in highpointing. With help from Don Berens he found out who the early 48 and 50 completers were. Of that early group the only one I knew about was Frank Ashley since I used his guide. On April 25, 1987, Clark, Joyce and I met Jack Longacre at a motel in L'Anse. Don Berens also from New York State was there. We were lucky that Dennis Whitehead and his friend George Johnson lived in Michigan. Dennis knew the route. It wasn't marked like it is now. There wasn't a register although there was a stake in the ground. Clark took the picture of the nine of us on the summit. Clark always carried a tripod with him for summit photos. Of the people there, five of us would be 50 completers -- Don Berens, George Johnson, Jack Longacre, Dennis Whitehead and myself. Clark ended up with 49 and Joyce 37. Jack's grandson Eric Kronz was there and so was a friend of George, Greg Lehman. I understand Greg will be there when the group scatters Jack's ashes on the 16th anniversary of that gathering on April 25, 2003. Tell us about the 1987 accident in which you had to be airlifted off of Granite after being stranded for three nights. A lot has been said about it. Don Jacobs includes a whole appendix on it in his guide on climbing Granite. I was climbing with Clark Hall, George Johnson, Terry Moyer from Utah, Dennis Whitehead and some others who never got much above Froze-to Death plateau. We were only about 100 feet vertical from the summit when I slipped and landed on a ledge. My right boot caught on a rock and my knee was bent at a right angle sideways. I could still walk but only on level ground. I couldn't move on that rough terrain. Clark and George went to get help while Dennis and Terry stayed with me. It really didn't hurt that much, but since Dennis is an emergency room doctor, he had a medical kit and he gave me a shot of something. We had to spend two nights on the ledge. We were lucky that we had good weather. There was a big storm down south over Yellowstone but we didn't get it. It wasn't too unpleasant to sit there and enjoy the scenery. Dennis decided to go ahead and finish the climb the next morning. He came back down and convinced Terry to do it also. Other climbers coming through were very helpful. They gave us all the food and water we needed. After two nights the 5 man rescue crew arrived. They lowered me down on the south side about 12 pitches in a Stokes litter. Each pitch was between 100 and 150 feet. We weren't able to make it all the way that day to where the helicopter was supposed to meet us. It looked like there was a storm coming up, so we stayed overnight under some boulders. The next day a helicopter out of Yellowstone Park picked us up and took us to Cook City. The Sheriff from Red Lodge who was in charge of the operation sent a van to pick us up and the following morning Clark took me to the emergency room in Billings. I flew back to New York State where the doctor who replaced my left hip did the surgery to trim the cartilage and tie the ligaments in my right knee. We went back to go skiing that winter with rescue crew at Red Lodge. I fell as I was getting off the lift and chipped my shoulder and wound up having to go back to the same hospital in Billings. That didn't cut our trip short though. I just had to wear a sling. Why did you start doing low points after completing your 50th state (Gannnett) in 1989? Somebody said what are you going to do now that you've done all the highpoints. I was joking, and said, I guess I will try all the low points. But earlier, in 1988 when we were going out to ski at Red Lodge we stopped at the Wyoming low point which is where the Belle Fourche River flows into South Dakota. We had to hike down along the boundary line fence. We ran into a rancher. He didn't mind us going down there but he said, "Watch out for the bulls." So that was the real start of it. Are there any rules for "lowpointing"? I don't think anybody has ever done them before so I made up the rules on my own. Most of the interior lowpoints are where rivers exit into adjoining states and you often have to follow a fence down to the river. On larger rivers the fences don't go all the way and you have to follow a compass heading. I don't know how precise that is. We usually try to get down to the water itself. We stick a toe in the water. There's no definition on how high the water has to be. What are some of your favorite low points? We went to the lowpoint of Arizona which is the Colorado River where it runs into Mexico. When we were there there wasn't a drop of water in it. All the water was in an irrigation ditch which runs parallel to the river. We just walked out in the middle of the dry riverbed. It was quite wide, probably 200 yards. In fact that's where the picture on the cover of the low points book was taken. We had checked with the immigration officials. They couldn't figure out why anyone would want to do that. I probably wouldn't want to try it now with the current border problems. What are some other interesting low points? The ocean beaches of course are quite nice. We visited the ocean or lake low points in each state. Our favorite beach low point was where Lewis & Clark ended their journey in Oregon. Nevada used to be difficult to access. It is at the very southern tip on the Colorado River. But recently I got an email saying that the Indians have built a casino there and it's just a few hundred yards from the casino to the low point, and there is now a bridge across the river. It's also a tristate-point if you go out in the middle of the river. What got you interested in doing a book on tri-states? They were always a curiosity. But when Clark, Joyce and I were coming back from a highpointing trip out West in 1990, we stopped at the three tri-state points in the Oklahoma panhandle. Later, after doing most of them I decided to write the book since there was growing interest in tri-points. The best reference is a government pamphlet, "Boundaries of the United States and the Several States, Geological Survey Paper #909." The edition I have is 1976 and I don't think it's been updated. It used to cost $5.20. I don’t know what it costs now. It has a tremendous amount of information on the boundary treaties and it goes into the boundary surveys for each state. There's also another book on the Principal Meridians. The Principal Meridians are the starting points for surveys. Some of them have handsome monuments. But the book itself is very technical and would be of interest mostly to surveyors. There's of course a tremendous amount of information on the web. There's Brian Butler's "Corner Corner" Website where you can incidentally downloand my tri-point book. And there's the BoundaryPoint Yahoo discussion group. I have posted a lot of information there including a report about the Oklahoma 2002 convention. Do you have a favorite tri-point? We liked the ones in the mountains in the West. There's the Colorado-Wyoming-Utah. It's up around 8400 feet. It's a lousy road but we were lucky to get there with a two-wheel drive. Idaho-Wyoming-Montana is on the Continental Divide in Yellowstone Park. It was still a desolate spot since it hadn't totally recovered from the 1988 Yellowstone fire when we visited in 1997. What do people think when you visit? Most people are very friendly and very cooperative. Once we had a property owner come at us with a dog and shotgun at Maryland-Pennsylvania-Delaware. After we told him what we were doing, he showed us the spot. You have also visited several European intersections. Many Europeans are very passionate about the points and boundaries. They have a lot of boundary quirks that interest them greatly. There are exclaves (land that is surrounded by another country); enclaves (the surrounded land) and condominiums (land that is jointly owned). For example, there's an island between France and Spain where the border runs down the middle. They take turns administering each year. I don't know of any place in the U.S. that is like that. I would like to document but not necessarily visit the quad county points. I think there are almost 200 of them including a five pointer in Lake Okeechobee in Florida. There was an announcement on the web that two of the BoundaryPoint guys rented a boat and went out there with a GPS and placed a buoy there. I'm not sure if it's still there. How has Marcy changed since your 1939 climb? More people. It's a good thing that the club went to Marcy in 1989. The hiking restrictions now prevent groups larger than 8 from hiking together. There's also restrictions on parking. If the Highpointers visited now they would have to climb in about 25 groups of eight. I don't think the park people would look kindly on that. They have also pulled down most of the leantos, placed restrictions on camping above 3,500 feet and prohibited camping above 4,000 feet in the summer. Photography, woodworking, renovations and gardening. We also have a cottage on Lake Ontario and I've done a lot of plumbing and electrical work on both houses. I also have a ham operator license but I haven't done that for awhile. Do you have any advice for the club? Nothing needs to be changed. With 100% volunteer operation it may be difficult to get enough volunteer help if the Club continues to grow. I am personally against paid officers because I've seen other organizations deteriorate after they had paid officers. Volunteers lose the incentive to help out. What's favorite thing about the club? The people. The interaction with the members at the reunions and on the climbs. My second favorite is the newsletter. It has lots of interesting articles. The friendships we have made with the club have been great. I met Jack Parsell in April 1987 on the Upper Peninsula of Michigan as we prepared to visit Mount Arvon, the newly recognized highpoint of Michigan. Three of the important people in Jack's life were there as he completed his 47th state highpoint: his wife Joyce, his long-time friend Clark Hall visiting his 46th highpoint, and his new friend Jack Longacre finishing his 50th or 51st. The thing that stands out for me about Jack Parsell is his good-humored persistence. He persisted about 50 years from his first state highpoint to his 50th, returning to Granite Peak despite a fracture and bivuoac. And what could be more good-humored than the quests for state low points and tri-state junctions? A perfect highpointer spirit! It is a pleasure for me to reminisce about my friend Jack Parsell, a template for the sort of person I'd like to be in my 80's. First I should give you a bit of background leading up to my first meeting with Jack. I had done about 8 HP's when I met George Johnson in Lansing while doing post-graduate training at Michigan State in 1977. He had rock climbing experience at Yosemite and naturally became interested in highpointing when I told him what I had been doing. George had been planning to climb the Matterhorn in 1980 and invited me along; our successful ascent led to a long climbing association which eventually included nearly half the state HP's. In 1986 George was in Nevada to climb Boundary and met Jack Parsell and Clark Hall coming down from the summit. They told him they had been climbing HP's for years, the first time either George or I had heard of others interested in highpointing. The following spring George called and said Jack and Clark wanted to come to the UP with some friends to climb Mt Arvon. Senior highpointers recall that before 1985 Mt Curwood had been considered Michigan's HP, but laser satellite imaging determined Curwood was about 2 feet lower than previously thought and that Arvon was 11 inches higher. Several of these climbers had been to Curwood and now wanted to climb Arvon. At that time Arvon's summit was exceedingly difficult to find, and since I had been there and lived nearby George asked me to guide the party. On April 25, 1987 I had the unique privilege of guiding this remarkable group (Jack Longacre and his grandson Eric Krontz, Don Berens, Clark Hall, George Johnson, Greg Lehman, Jack and Joyce Parsell) to the summit for what is now regarded as the first meeting of the Highpointers Club. My recollections of that day are quite fresh. I could tell Jack Longacre was a charismatic innovator, that Don had the quiet humility which marks great climbers, and that Jack Parsell and Clark were a couple of real characters with a long history together. In fact it's hard to separate Parsell and Hall for me because almost every time I saw them they were together, and having a great time. I also recall speaking with Longacre on the way back about finally having enough people to get a highpointing club going, and when we got back to L'Anse we all pledged to make it a reality. With Jack Longacre's energy and vision we did. Four months later Jack Parsell, Clark Hall, George Johnson, Terry Moyer and I started up Granite Peak from Froze-to-Death plateau expecting a challenging and enjoyable climb. We had no inkling what high adventure was in store for us. We had gotten up on Froze-to-Death plateau quickly and enjoyed camping there overnight. The next morning we crossed the snow bridge at Granite's base in fair weather and made good time ascending. About halfway up we had a near disaster when Clark and I nearly fell off the peak. Clark was last in line when I knocked a rock loose on a steep section. I shouted a warning but Clark didn't hear it -- he frequently took out his hearing aids when climbing -- and it squarely struck the top of his head. He staggered and seemed about to fall as I desperately scrambled down a couple of feet to grab him, when I slipped and just managed to grab an outcropping with both hands, hanging there with my feet dangling over open space. I vividly recall George above me and the look of fear on his face as he yelled "Hang on, buddy!" When we both got safely situated I got out my medical pack and sutured Clark's laceration, perhaps a little shakily. It was getting late but the weather was still good so we soldiered on, thinking if we maintained a fast clip to the summit we could still get back to camp on the plateau by twilight. Approaching the keyhole just below the summit we missed the turn to the right and continued up a steep chimney. Jack was leading with George just behind him. On reaching an overhang Jack realized he was going the wrong way and began to descend. 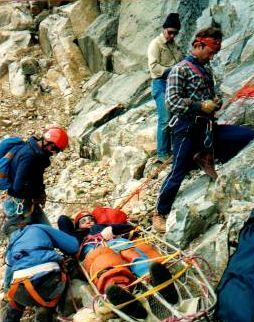 George placed a rope to assist in the descent, but as Jack was coming down he lost his grip and fell toward Terry standing at the foot of the rope. Fortunately Terry is built like a defensive lineman and made the best tackle I ever saw, saving Jack from flying off the peak to certain death. It was evident Jack had a leg fracture with a serious knee injury, and that weightbearing for him was out of the question. We carried Jack to a narrow ledge about 5 feet wide and 10 feet long, just enough room to extend his splinted leg out in front of him. After making Jack comfortable we quickly discussed our options, realizing that anyone descending would have to cross the snow bridge in the dark. Although I didn't think Jack had any other injuries it seemed wise to seek immediate help. Since I had the medical pack I offered to stay with Jack, with Terry deciding to stay also so there would be emergency backup for Clark and George in case something happened to them on the way down. Clark and George gave us most of their provisions and extra clothing, then made a heroic descent for help as darkness loomed. They successfully crossed the snow bridge but couldn't find our camp on the plateau. They did, however, stumble across a tent occupied by Brian Spuhler, who happened to be a member of the Skytop Rescue Service based at the Carbon County Sheriff's office in Red Lodge MT. This courageous Good Samaritan put the exhausted Clark and George in his tent and immediately hiked out to the trailhead in the dark to assemble the rescue team. Terry and I spent a cold night shivering with Jack on the ledge. We told a lot of tall climbing stories, and I was amazed at how cheerfully Jack endured his serious injury. The three of us huddled together for warmth, and gave Jack as much of our extra clothing as we could spare. I recall dozing fitfully and awakening with a start as I dreamed I was falling off the narrow ledge. During the night there was some snow and the rock became even more precarious. As the morning sun rose we all felt better and I decided to give the summit a whack, as much to warm up as to complete the climb. I had no trouble finding the cairn we had missed the day before and made the top in a few minutes, giving a shout of triumph that Jack and Terry heard below. I could see well into Yellowstone on the clear cloudless morning. On my return to the ledge I showed Terry the way and he too made the summit. Ever the selfless team player, Jack seemed more excited at our summiting than Terry and I were. Terry then bid adieu and headed down, eventually finding our camp and packing out all of our gear on the plateau by himself. What a mule! A couple of climbers came past that second day who gave us more food and water. I wasn't sure how long it would take for a rescue party to arrive or whether a helicopter could pluck us off the peak (not a realistic hope in retrospect), so I kept looking and listening for signs of assistance. We endured a couple of late afternoon thunderstorms which dashed our hopes for early rescue. Then a seemingly interminable colder night on the ledge, made worse by lack of food. We spent much of the night talking about Jack's climb of Denali, which conversations I well recalled during my own climb there 5 years later. I really didn't get any sleep until the sun warmed us up, and around noon we heard something that sounded like singing from below. Talking Heads tunes no less, a most auspicious portent. The Skytop Rescue Service had arrived. The six SRS members got Jack in a litter within a few minutes, and I gave him a shot of Demerol to mitigate the pain of banging around during the rappel pitches. Shortly thereafter we began the 20+ pitches we'd need to get Jack down a couple of thousand feet to an area level enough for a helicopter from Billings to make the pickup. The SRS guys were amazing, well organized and well practiced for exactly this type rescue. Due to our late start it became apparent we'd never get down before dark, so they radioed Billings to expect a pickup the next day. Scott Mann, the SRS leader, knew of some small caves in the cliff face and we spent the night in those rocky indentations, a bit warmer than before due to the lower altitude and better shelter. The following morning we finally got Jack down to a runout section at the base of the cliff. Almost immediately after setting down his litter a car sized boulder came bounding down the bowling alley we'd just descended and smashed within inches of Jack's head! We all thought he'd been killed and bent over him to assess the damage. Still zoned from another shot of Demerol, Jack smiled dreamily at us and said, "Hey, anybody got something to eat?" He didn't have any idea how close he'd come to buying the farm after all he'd been through! The helicopter from Billings didn't have enough engine power to maneuver safely at our altitude in the high winds that day, so an Aerospatiale Lama was summoned from Yellowstone Park. Eventually Jack was picked up and evacuated to Billings. Surgery to replace his knee and repair the fracture was successful. True to form he summited Granite a year later, guided by Scott Mann. Jack Parsell is a most remarkable gentleman, an embodiment of the determination and strength Highpointers Club members are known for. I was privileged to be with him on his most difficult climb. I learned from Jack how a real man handles adversity: with humor, patience, and acceptance. I was proud to be with him when our club was founded, proud to be with him on that narrow ledge, and proud to have him as my friend. As I recall, Jack started up the chimney and stopped at the overhang. I climbed up with my rope and he tied it of on a rock. I rappelled down and Jack slipped when he caught his foot in a crack. His upper body lost strength and he came down fast into the arms of Terry Moyer. When Clark and I found the tent on upper Froze to Death plateau, it belonged to a guy named Brian. We were most fatigued, we helped him get ready and off he strode down the mountain. We watched his headlight bouncing down the hill for several minutes. We found a puddle to drink from and continued to stagger down toward our tents in the night. We never found our tents, Clark and I hunkered down behind a foot high rock to get out of the wind and lay on what was left of my rope for insulation. After Dennis got Jack situated on his ledge, I cut off the rope as high as I could reach to use on the way down. That is the rope you guy's saw waving in the wind. The rescuers actually returned it along with my canteen and down jacket. Meanwhile Clark and I froze on Froze to Death that night. He commented on the ice which formed on the scant puddles. Clark and I talked to keep awake and avert hypothermia, I got to know the man quite well. He told me night's like this waiting for dawn build character. I know he had character. He told me he first froze his feet as a foot soldier during the Battle of the Bulge. He said the closest aid station was German. When I think about the Highpointers Club, I think about Jack and Joyce Parsell. Here are two people who were there at the very beginning of Our Time, and they're still going strong. They are not just members, they are very active and contributing members, part of what makes our Club the great organization it is. To enlist their help for OK-2002, all I had to do was ask and they were busy planning the Tri-Pointing Event for OK-2002 way back at HI-2000. Now that's dedication. So not only do I say I am delighted to call them friends of mine, I am happy to have this opportunity to thank them publicly for all they do, and have always done, for the Highpointers! See you at IL-2003. I had the pleasure of sitting near Jack and Joyce Parsell at the first convention I attended in 1990 in Texas. They were instrumental in making us feel welcome and being part of the Highpointers. Their enthusiasm and personable nature convinced us to continue to be involved with the club. Jack and Joyce have been very active in the Highpointers Club and have made many significant contributions to Highpointing and exploration of state low points and tripoints. It has always been a pleasure to see them in attendence at the conventions and to renew our friendship each year. Jack and Joyce continue to be a model for what Highpointing and the Highpointers Club is all about. Thank you Jack and Joyce for your friendship and contributions to the Highpointers Club.